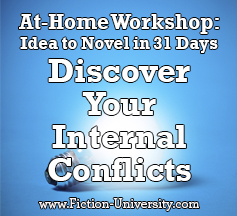 Welcome to Day Fifteen of Fiction University’s At-Home Workshop: Idea to Novel in 31 Days. For the rest of the month, we’ll focus on plot and the major turning points of a novel. Today, we’re heading inside our characters to discover their internal conflicts. 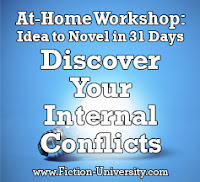 Internal conflicts are the issues the protagonist faces on a mental or emotional level. They’re internal battles that require emotional sacrifices and tough choices that challenge a personal belief. The internal conflicts help make the external choices more difficult, as well as help create the character arc. The internal conflict is most often a personal struggle that deals with the protagonist’s self-worth or beliefs in some way. This is the conflict that will allow the protagonist to grow however she needs to in the novel. In character-driven stories, this is where the main focus of the novel lies. Why internal conflicts are important: Internal conflicts drive the character growth and character arc by giving the protagonist something personal to overcome. They also help create unpredictability in the protagonist. If she always does the right thing (as heroes often do), then there’s no doubt how she might act when faced with a tough situation. But if her beliefs conflict with “the right thing,” then her actions become uncertain. Will a protagonist who’s been oppressed her whole life risk her life to save the son of her oppressor? On Day Eight, we looked at creating the character arc, and internal conflicts are key factors in creating internal change. If your story has a strong character arc, you’ll want strong internal conflicts to support it. 1. What are the internal conflicts in the book? List five possible ways your characters can be conflicted. 2. How might the protagonist’s personal beliefs hinder her in achieving her goal? List five possible ways her personal goals might conflict with her plot goals. 3. Are the internal conflicts part of a character arc? How? EXERCISE: Summarize your internal conflicts. Not all stories will have a character arc, but you’ll usually see some type of internal conflict. Describe the issues that will make it emotionally or mentally harder for the protagonist to resolve the challenges of the novel, and why that matters to the overall story. What makes external and in external conflict work so well together is how they can pull the protagonist in different directions. The internal conflict drives the character growth or emotional layer, while the external conflict drives the plot. In other words, the external conflict decides the plot and creates the goals, while the internal conflict makes those goals harder to accomplish and teaches the protagonist a lesson in the process. Tomorrow, we’ll look at creating the stakes.